In terms of its social demographic, the city of Toronto is extremely diverse and multicultural; it is home to eight per cent of the population of Canada, however, it has 20 per cent of the country’s entire immigrant population, and 30 per cent of all recent immigrants. On top of this, half of the population of Toronto were born outside of Canada. In terms of its environmental thinking, Toronto is also an extremely forward thinking place, and has some great initiatives for helping the environment. Being green is big business in Toronto, lots of businesses make their money from offering innovative green services. One of these companies is Frogbox. Frogbox are a Toronto based company from that helps people to be bit more environmentally friendly when they’re moving house. Moving house normally involves the use of lots of cardboard boxes. However, Frogbox helps to reduce the unnecessary waste caused by the disposal of cardboard boxes. Instead of using the usual method for temporary storage, Frogbox rents out reusable plastic boxes. Toronto also has a big eco-friendly fashion scene the city has lots of shops offering products from the green designers. Lots of the clothes have green friendly slogans on them, however, it’s how they’re made that really shows how eco-friendly they are. The clothes companies help to ensure their products have as low an impact as possible on the environment through various means, including delivering products to customers’ houses by bicycle and using natural dyes for the clothes. 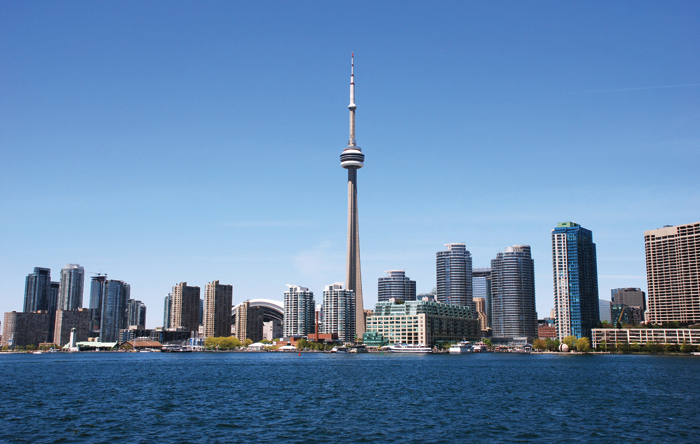 Toronto tries to power itself as much as possible by green electricity. This is possible thanks to the excellent renewable energy systems that are in place in the city. A lot of the renewable energy created in Toronto is through wind generators. As part of the wind power energy system, the city installed a 91 metre tall wind turbine in its city centre. in 2002. It was the first of its kind in the centre of a major urban city in North America. The wind turbine adds an average of 1000 MWh to the city’s main power grid every year; to put this into perspective, around 12 megawatts powers 10,000 homes for a year. The eco-friendly buildings in Toronto are world-renowned. In 2011, three of the 10 finalists in the Zerofootprint Re-Skinning Awards were from Toronto. The award celebrates retrofitting projects from around the world in the that aim to reduce the impact that cities have on the environment. Although, none of the nominees from Toronto won the final award, the high percentage of retrofitting projects nominated from the city shows that it is at the forefront of sustainable living. The winning building was The Palms in Venice, California. The three buildings nominated from Toronto were Artscape Wynchwood Barns, Humber College’s Centre for Leadership Justice and First Canadian Place.